Halloween is a most creepy and scary festival celebrated by the peoples from around the world. Peoples love to have a look which they like in the creature world. As I am following this festival very closely and noticed that women’s loved this festival. So why women’s love this festival? Because they are an expert in makeup and Halloween makeup is a most important part of this festival. There are thousands of types, makeup ideas which can be done for the Halloween and some of them very popular. Halloween gives an opportunity to show the creativity and expertise in the Halloween makeup. But if you choose to hire a makeup expert for your Halloween makeup, then definitely it will cost you lot’s money. As most of your family members love to have makeup for the Halloween. Because every age people love to do the makeup for the Halloween. So it can be much better if you choose to make your own makeup and also help your family member to get ready for this festival. Making DIY Halloween makeup not an easy task. Because you have to take care lot’s of thing in that. So before the start, you must need to have a clear direction and required material for your makeup. You can find a thousand types of makeup ideas over the internet and Pinterest. But the most difficult thing that they are just images and there is no guide to make that makeup. To solve your problem we have to spend lot’s of time on the internet and make a beautiful list of 62 Halloween Makeup Tutorials which will help you to make this Halloween more Creepy. In this post, you will get all types of Halloween makeup ideas which are popular on the internet. We have a make a perfect collection, which can be useful for all ages men’s, women’s and kids as well. Some of the most popular Halloween makeups are Bloody, Bunny, Clown, Comic, Deer, Ghost, Sugar Skull and much more. Scroll down below and check all the tutorial and choose the best one for this Halloween. Try to choose a kind of makeup idea which you think can be done easily. Feel free to share these DIY Halloween Makeup Tutorials with your friends and family. You can also share them on your social profiles. If you make your own unique DIY Halloween Makeup which is not on this list. Please send us your tutorial and we will add to our list. Enjoy! Halloween makeup must be unique and attractive. No makeup can be better than Angel Halloween Makeup. As Halloween is a festival for the scary and creepy makeup. But if you want to be looking unique and want to grab the attention of the people in the party. Angel Halloween Makeup can be a perfect choice for you. You can choose your Halloween costume according to your makeup. Choose a kind of Halloween costume which can match with your Angel Halloween Makeup and get the attention of the peoples in the party. This makeup can be done by any age women and if you are young women then you must love to give a try to this beautiful Angel Halloween Makeup. To learn a complete direction of this makeup check the below video for complete guide. Most of peoples think that Ghosts and monsters are the most important part of the Halloween makeup. But if not compulsory to choose a Ghosts and monsters as a Halloween makeup. You can choose your costume and Makeup according to your choice. If you are a person who love the animal, then Animal Halloween Makeup can be also a perfect choice for the makeup. This beautiful Fox Animal Halloween Makeup can be a better choice for you on this Halloween, and you can get the costume very easily from the local store. Choose to make Animal Halloween Makeup this year and rocked the party with your attractive and unique look. To get the complete direction of this makeup follow the video under the image for a step by step tutorial. Halloween is festival of darkness and if you want to really celebrate this festival in its real way. Then you must have to choose Black Halloween Makeup. As people celebrating this festival for fun and use the makeup to scare the peoples. So if you want to scare the peoples on this Halloween then you must have to choose a kind of makeup which can really scare the peoples. Only makeup can not scare the peoples, so you must also need to have a kind of Halloween costume which can match with your Black Halloween Makeup. It can be any type of dark makeup, you can choose to be a ghost or anything else which can show the darkness of this festival. If you like the Black Halloween Makeup shown below and wanted to learn a complete direction of this tutorial. Follow the kireimakeup.com for a complete direction. Bloody Halloween Makeup is a very popular makeup for the Halloween. It can be any types of Bloody Makeup, You can choose to give a bloody look to your eyes, to your mouth and you can use use zipper to get the bloody look. Bloody look represents the scariness and creepiness of this festival. The best thing about this festival that you can do that without having a costume. If you like the Bloody Halloween Makeup shown below and wanted to learn a complete direction and required material for this makeup. Follow the video below the image for a complete tutorial. This Bloody Makeup is very easy to make and can be done at the last minute as well. So if you are late to get ready for the Halloween party, then this Bloody Makeup can be a perfect choice for you on this Halloween. Apart from the dark themes and scary creatures theme Halloween can also be celebrated in different ways. As Makeup is a most important part of the Halloween and it’s not compulsory for everyone to have a scary and creepy look. Pupils can choose different ways to celebrate this festival. The bunny is a most popular character for the Makeup in Halloween and most of women love to have a beautiful Bunny Halloween Makeup. The best thing about this makeup that it can be done very easily. If you choose to make a Bunny Makeup for this Halloween, then you also need a beautiful costume to make this makeup look beautiful. You can rock the party and get the attention of white peoples in the party with this makeup. To learn a complete direction and required material for this makeup follow the video given below the image and get the perfect look for this Halloween. Women’s who want to look scary on this Halloween can give a try to kind of makeup, which can give them the scary look. Catrina Halloween Makeup can be a perfect choice for some women on this Halloween. Catrina Makeup looks similar to the sugar skull, but much easier compared to the sugar skull makeup. So if you are women who don’t love to choose dark theme makeup for the Halloween. Catrina Halloween Makeup can be a perfect choice for them. If you choose to wear a Catrina Makeup for this Halloween, make sure you have enough time for it. In this makeup you need to use different color and design. To learn a complete direction and required material for this makeup. You must love to follow the YouTube video given below the image. Follow the video and get the step by step tutorial for this cool makeup. It’s always a fun to have a beautiful makeup for the Halloween. But if you want to have makeup for the Halloween party, then you must have to think the twice before you choose your makeup for the Halloween party. As you must be thinking about to have makeup, which can grab the attention of the peoples in the party and can be unique. This beautiful Cheetah Halloween Makeup can be perfect choice for you on this Halloween. The best thing about this makeup that it’s very easy to make and can be done in less time. You will also get the opportunity to choose awesome costume which can match with your makeup. To learn a complete direction of this Cheetah Halloween Makeup and required material. Follow the YouTube video below the image. You will get the step by step direction of this makeup in the video. Clown always does the kind of activity which can force people to laugh. A clown is a most popular character for the Halloween. So if you are a person who always love the clown then you must love to have a beautiful Clown Halloween Makeup this year. It can be a perfect makeup to attend the Halloween party. If you want to have a perfect look with your Clown Makeup then you must have to choose kind of costume which can give a funny look to your Clown Halloween Makeup. This makeup is popular among the man and women. To learn a complete direction and required material for this beautiful Clown Halloween Makeup. Follow the YouTube video below the images. You will get the step by step direction in the video for this Makeup. All age peoples love to read the comic book and every person has some favorite comic book characters. If we follow those peoples, we can see the clear effect of the comic book characters in the daily life. As Halloween is a big festival and people love to do make on this festival. So if you are lover of comic book characters then you must love getting the look of them on this Halloween. Comic Halloween Makeup have a variety of choices and people can choose any of them. When you do the Comic Halloween Makeup, you must need to choose a kind of costume which can match with your Comic character. This beautiful bakers up will give you a unique look to rock the party. To learn a complete direction and required material for this makeup. Follow the besthalloweenblog. blogspot.com for a complete tutorial. Halloween is a time when your people can show the craziness about the Halloween makeup. Makeup is most important part of the Halloween and your festival can not look perfect without doing makeup. If you are a person who always loves to do the crazy thing, then nothing can be better than doing a Crazy Halloween Makeup. The makeup theme can be anything, it can be creepy, scary or ghostly look. This crazy makeup can grab the attention of the peoples in the Halloween party. If you like this Makeup idea and wanted to learn how you can make it. Follow the YouTube video below the image for a step by step direction and required material for this Makeup. You might be wearing a Halloween costume from the last few years and you want to try something creative this year. As people always love showing creativity and no time can be better than Halloween to show your creativity. Choose to make a Creative Halloween Makeup this year and inspire the peoples to have something similar to yours. This beautiful, creative makeup can be a perfect choice for you on this Halloween. Doing makeup for the Halloween didn’t mean you don’t record a Halloween costume. It’s better to make a kind of creative makeup, which can look awesome with your costume. If you like this makeup idea for Halloween and wanted to learn how you can make it. Follow the www.byrdie.co.uk for a complete tutorial and required material for this DIY makeup. A Nun is very kind person and she believe to help the poor and needy peoples. Have to ever think that a nun can be look creepy and scare the peoples? But you can do that, by doing Creepy Halloween Makeup and wear a nun costume. Halloween is a very popular festival and makeup is a most important thing about this festival. If you really want to scare your neighbors and people in the party. Then you must love to give a try to this very Creepy Makeup for this Halloween. As makeup and costume both are important this festival. So give a Creepy look to yourself and wear the nun costume. You will definitely scare the all peoples in the party after wearing this makeup and costume. If you like this makeup and wanted to learn how you can make it. Follow the modernfashionblog.com for a complete tutorial and required material for this Makeup. Halloween is a festival of darkness and peoples love to scare the neighbors and friends in this festival. Halloween can be celebrated in different ways, but if you are a lover of scary and the creepy theme, then you must have tried something very dark. Try this awesome Dark Angel Makeup for this Halloween and grab the attention of the peoples in the party. You must need to have kind of Halloween costume which can match with your Makeup. If you like this makeup idea and wanted to learn how you can make it. Follow the video below the image and get the step by step direction and required material for this DIY makeup tutorial. It’s always an awesome experience to get the look which you love the most. Halloween can be a perfect time to show your creativity and craziness about the makeup. So if you are an animal lover and wanted to have an animal look on this Halloween then Deer Halloween Makeup can be a perfect choice for you. The best thing about choosing Deer Makeup is that you can get a chance to wear an awesome costume with Deer Makeup. Anyone can have this makeup for the Halloween and but it’s most popular among the women’s. So if you want to rock the Halloween party this year then you must need to learn how you can do this makeup by yourself. To learn a step by step direction and required material for this DIY project. Follow the www.cheapfrillsandthrills.com for a complete tutorial. Check the YouTube video tutorial below the image for this beautiful Deer Halloween Makeup idea. When we talk about the creepy and scary thing, remembering of the dead day. The Devil always comes in our mind, Peoples believe that Devil kills the peoples. Halloween is a festival of creepy and scary makeup and everyone love to do the make on this day. If you really want to celebrate this festival with the real meaning, then you must need to do a kind of makeup which can really relate from this festival. Devil Halloween Makeup can be perfect choice for this festival. Choose your costume according to your makeup. You can purchase the ready costume from the store or if you have some time do it by yourself. To learn a complete direction and required material of this Devil Makeup for Halloween. Follow the www.candidlyclaire.com for a step by step tutorial. All age peoples are crazy about the Disney world and everyone has their favorite character in Disney. Kids love to visit the Disney world. So if you have kids and wanted to show them the Disney show at home on this Halloween. Then you must have to choose kind of makeup, which can read from the Disney world character. This Princesses Disney Halloween Makeup can be a perfect choice for you on this Halloween and your kids will definitely love this makeup. You can choose a Disney Princess costume to get the perfect look. This Disney Halloween Makeup showing that the Cinderella tripped and fell on her crystal shoes. Anyone can make this awesome DIY Disney Halloween Makeup very easily. If you like this makeup idea and wanted to learn how you can make. Follow the www.boredpanda.com to learn a step by step direction and required material for this amazing Princesses Disney Makeup. Peoples think that’s scary and creepy things can be done with fangs and blood, but it’s not truth you can still get the creepy and scary thing without using fangs and blood. This Halloween you can give a try to get the look of Doll. A walking pale doll would be quite frightening to see at night. So if you want something very scary and creepy then you must love to give a try to this stunning Doll Halloween Makeup this year. Give yourself a doll look for the upcoming Halloween party. The stitches on the both the cheeks of this doll can scare all the peoples in the party. You can do this makeup by yourself very easily and it will not take much time. To learn a complete direction required material for this DIY Doll Halloween Makeup. Follow the YouTube video below the image for a complete tutorial. Eyes Halloween Makeup can be done in different ways. You can choose simple eye makeup, which can give you a charming look and can grab the attention of the peoples. But as all know that Halloween is a festival to scare the peoples. So if you really want to scare the peoples on this Halloween then you must need to try a kind of eye makeup which can look very creepy and scary. Bloody eyes is about the best choice, but if you still want to more creepy look, then you can give a try to this very scary Eyes Halloween Makeup. Basically, these types of makeup don’t require any costume. But you can wear a kind of costume which can match with your makeup theme. You might be thinking that this Eyes Makeup required lot’s of time to make it. But with the help of tutorials you can do it very quickly. To learn a complete direction and required material for this DIY Eyes Halloween Makeup. Follow the ellimacs.com for a complete tutorial. You can also follow the YouTube video below the image for a step by step direction. If you want to get a kind of look for the Halloween then you must need to use Makeup and costume together. Fairy Costume is very popular for the Halloween and if you can’t afford to purchase. Just go to the store and purchase a pair of wings. Now you need to have a kind of fairy makeup, which can match with your costume. You can choose to have Fairy Halloween Makeup This year. As you are going to make your costume and make by yourself at home. So you need a kind of source which can guide you in a proper way. A complete tutorial of Fairy Halloween Makeup and costume can help you in a better manner. To learn a complete direction and required material for this Makeup. You must love to follow the www.seventeen.com for a step by step direction. If you are a person who loves to have an animal look for the Halloween, then this beautiful Fox Halloween Makeup can be a perfect choice for you. It’s not necessary to wear a kind of animal makeup and costume which look creepy and scary. You can choose kind of animal theme for your makeup, which is not scary. The Fox can be a perfect choice for the peoples who want to have makeup for the Halloween but not the scary one. Well, doing makeup for the Halloween is always a tough task, because everyone wants to have a kind of look which can grab the attention of the peoples. This beautiful Fox makeup can be done very easily and grab the attention of the peoples in the party. To learn a complete direction and required material for this DIY Fox Makeup for Halloween. You must love to follow the www.thewonderforest.com for a complete tutorial. The YouTube video below the image also has a complete tutorial. As we all love to celebrate the Halloween and we all love to get a creepy and scary look for this festival. But if you want to have some fun with your Makeup this year. Then you must have to choose a kind of makeup and costume which can give you an amazing look. Making a Fun Halloween Makeup is not a tough task, but you need to choose your makeup theme very carefully to get a look which you are thinking. If you are a person who loves to Disney look for this Halloween then you must love to give a try to this beautiful Mickey mouse look on this Halloween. The best thing about this makeup that it can be done in very quick time. Just go to the store and purchase a Mickey mouse and do some makeup. To learn a complete direction and required material for this Makeup. Follow the www.thediaryofadebutante.com for a step by step direction of this makeup. Halloween is a festival of creepy and scary things. No other makeup and costume can be better than Ghost Halloween Makeup. There are so many other makeup, which you can choose. But if you really want to celebrate this festival in real manner, then you must need to have a very scary and creepy makeup. If you go to the local store to get the ghost Halloween costumes, you will get thousand types of choices. Ghost Makeup can be done in so many ways and you can see the one of makeup idea in below picture. If you like this makeup idea and wanted to learn how you can make it by yourself. Then you need to follow the YouTube video below the image. You will get the complete direction and required material for this makeup tutorial in the video. It’s always a common thing that girls always love to wear the girly thing. It can be clearly shown in the Halloween makeup as well. If you are a girl and they you must love to choose a kind of makeup, which can give a beautiful girly look on this Halloween. This Half face makeup can be a perfect choice for this Halloween to get an awesome Girly look. As girls always love to do the make by them self. Below Girly Makeup can be done very easily and will not take much time. If you like this makeup idea and wanted to learn how you can do it yourself. Then you must love to follow the bloglovin.com for a complete direction and required material for this beautiful makeup. It’s always a tough task to choose a makeup for Halloween. Because there are thousands types of design available in the makeup. As you must be thinking about to choose a kind of makeup, which can give you a perfect Halloween look. Most of peoples think that Gothic Halloween Makeup can not be a perfect choice for the party. But as we are living in the modern world and there are no standards for the makeup. If you want to look unique and wanted to wreck the Halloween party, then you must love to give a try to this Gothic Makeup idea shown in the below picture. The best thing about this make that it can be done in very quick time. To learn a complete direction and required material for this makeup. Follow the YouTube video below the image and enjoy. Halloween is creeping up every year and every one wants to try new makeup every time. After seeing this awesome Half Face Halloween Makeup, you will definitely love to try it. So if you like this makeup idea, then you must be keen to know how you can make it by yourself. The most important thing required for this makeup is black & white face paint, a couple of old brushes and then your make-up bag. As everyone can’t afford to hire a professional makeup artist, so it’s always a good choice to do it yourself. It will save your time and money. To learn a complete direction of this DIY makeup. Follow the www.zoenewlove.com for a step by step direction. Have you ever thought about that why peoples love to wear the scary and creepy Halloween makeup and costumes? They did that because of Day of The Dead Halloween. Many people’s love different types of makeup and costumes. Day of The Dead Halloween Makeup is a one of the most important and popular makeup for the Halloween. This makeup mostly famous among the women. So if you are women who always love to try different makeup for Halloween every year. Then you must love to give a try to this beautiful and awesome Day of The Dead Makeup on this Halloween. You can make this makeup by yourself. To learn a complete direction and required material for this DIY Day of The Dead Makeup. Follow the www.emmamag.com for a step by step direction. We Always think that makeup is a kind of thing which can do only by women. But it’s not truth men’s also can wear the makeup for some special event. Every love to wear a creepy and scary costume on Halloween and this is a time when anyone can get the Makeup. It’s always a tough task to choose the makeup for the boys on Halloween. But there are some makeup, which can look perfect on the man’s face and zombie is a one of the most popular makeup ideas among the men for Halloween. There are many more Halloween Makeup for Boys which can be wear by the men. IF you like this stunning makeup and wanted to have it on this Halloween. Then you must love to learn a complete direction and required material for this DIY makeup. Follow the YouTube below the image for a step by step direction of this DIY Makeup tutorial. Being a couple means you have to be caring and sweet to each other for all the time. As Festival is a great time to spend some quality time with the family and your loved one. Halloween is a very popular festival for wearing a creepy or scary makeup and costumes. Every person has his/her own choice for the makeup and costume for the Halloween. But if you are a couple and wanted to rock the party with something very unique. Then you must love to try a kind of makeup and costume which can be worn by both of you. Halloween Makeup for Couples can be anything, because it’s depend on the path of the person. So if you are a couple who love the pop art, then you must love to give a try to this awesome Couple make up for the Halloween. This makeup can be done very easily and will take your much time. If you like it and wanted to learn how you can do it yourself. Follow the YouTube below the image for a step by step direction and required material for this DIY makeup tutorial. Every girl loves to do the makeup and if all about the Halloween Makeup for Girls then no girl would like to miss it. Halloween is a time when everyone can get the look which they want and it can be any type of makeup. Most of love chooses a kind of makeup, which give them a very creepy and scary look. But if you a girl who don’t like bulky makeup, then this beautiful makeup can be a perfect choice for you on this Halloween. The best think about this make that it can be very quickly and easily. As we know that Coastume always play an important role in any makeup. But this makeup also don’t require to purchase a costume you can make costumes for this makeup at home. If you like this simple and easy DIY makeup idea. Then follow the YouTube video below the image for a step by step direction and required material for this DIY makeup. There are very few makeup ideas which can adopt by the guys for the Halloween. But the ideas which are available can give you an awesome look on this Halloween. This stunning design of Day of The Dead Makeup can grab the attention of the peoples in the party on this Halloween. This makeup will give a very amusing look and you don’t need much to do this makeup by yourself. The best thing about this makeup that you don’t need to purchase a costume for it. It can be look perfectly with your normal clothes. Halloween Makeup for Guys can be done in many other ways. But this one can be a perfect choice for a young man. If you like this makeup and wanted to learn a complete direction and required material for this DIY makeup. Follow the www.babble.com for a complete tutorial. We all are busy talking about the Halloween Makeup Ideas for Men’s and Women’s. But what about the kids? They also love to have a make for the Halloween and we can’t skip to get them ready for the Halloween. There are many types of makeup ideas which we can choose for our kids. But we always love to choose a kind of makeup, which not look much scary and creepy. So if you have kids and looking for a makeup ideas for this Halloween then you are at right place. As we all know that kids love the super heroes. So you can choose a character which favorite of your kids. If your kid is a fan of batman or superman then he will definitely love this awesome Batman vs Superman makeup on this Halloween. This make is very easy and can be done very quickly. To learn a complete direction and required material for this DIY Halloween Makeup for Kids. Follow the YouTube video below the image for a complete tutorial. Peoples love to get ready for the Halloween. This festival is very popular among the young peoples. If you see this, post full about the Halloween makeup for the girls. But men’s also love to wear the makeup for the Halloween. As I have spent lot’s time over the internet to make this amazing DIY Halloween Makeup tutorials collection. I noticed that one of the most popular Halloween Makeup for Men is Zombie Skull Makeup. Most of the men’s love to have this makeup for the Halloween. 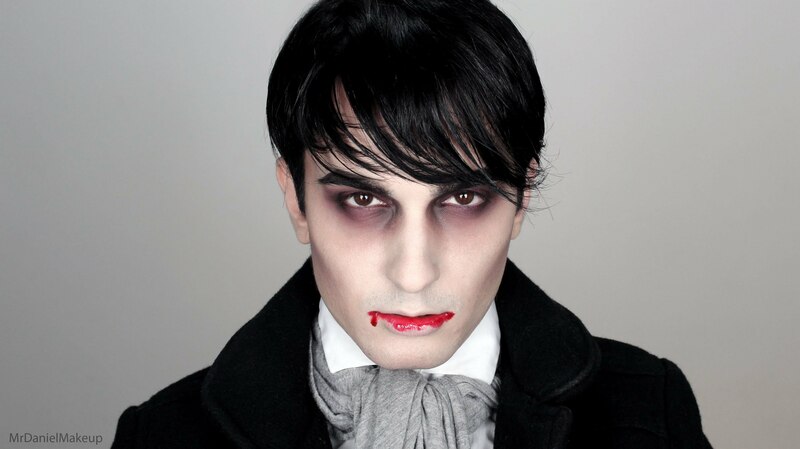 So if you are men and looking for a kind of makeup ideas which can help you to rock the party on this Halloween. Then you must love to give a try to this awesome Zombie Skull Makeup this Year. To learn a complete direction and required material for this DIY makeup. You must love to follow the YouTube video below the image for a complete tutorial. In the video you can see that Joseph Harwood doing this Makeup on her face. But if can be a perfect makeup idea for Men’s. This awesome Halloween Makeup for Teens can be a perfect choice for this Halloween. Here is a guide to make this Makeup with a very easy step. Draw your mask shape with a white eyeliner. It’s not necessary, but you can also cover your eyebrow with white too. Now draw a cat eye shape with a black eyeliner and smudge. Fill in your shape with the eyeliner and smudges. Tight line and waterline your eyes, take a red water based and fill in the mast area. Now set with a red eyebrow and add your green face paint to all the areas of skin that will be showing. One more thing doesn’t forget your ears and get a friend to do your back if it will visible. You May need to add multiple layers to get a super opaque coat. Dust with a translucent powder to set outline your mast with a black eye shadow to create a shadow. Blend this out with a dark green or black eyeshadow depending on what you have. Contour under your cheekbones, Temples and the outer perimeter of your face with the dark green or black. Add some frown lines between your brows and more shadow around the top of the mask. To follow the step by step direction of this awesome Teenage Mutant Ninja Turtles Halloween Makeup Look. Check the YouTube video below the image. As we know that there are no criteria for Halloween Makeup for Women. But there are some very popular makeup ideas which are loved most by the women, So that’s the reason we called it Halloween Makeup for Women. This awesome Harley Quinn, Makeup can be a perfect choice for any women who want to have an amazing makeup on this Halloween. Julia Graf explains each and every point of this makeup in the Video below the image. Making DIY Makeup for the Halloween is not an easy task and you must need to collect the required material before you start making your makeup. Also, choose a kind of time and place where no one going to disturb you during the makeup. Follow the video below the image for a complete direction of this Makeup tutorial and required material. This stunning Black Widow Halloween make up will definitely get the attention of the peoples in your workplace. If you like this makeup idea and wanted to make it by yourself, then for what you are wetting for. Let’s get started, First thing you have to do, get started doing the foundation. Choose any type of foundation which you thing can be good for your skin. Cover your face and neck with the foundation. Now use the back eyeliner, start with your eyebrow and use the red lip liner pencil to color in your eyes. Take a red eye shadow and patch up with the help of brush over your red eyeliner. Nikkia Joy makes a complete video tutorial for this Makeup and if you want to learn a step by step direction and full required material for this DIY makeup tutorial. Follow the YouTube video below the image. This makeup is very easy and you can do it yourself with the help of this easy and awesome video tutorial. As it’s always a tough to choose what type of mask you can wear to the Halloween and If you choose the design, then you must have to spend lot’s of money to get that mask from the store. So For those of you who don’t feel like buying an expensive costume, you can always use your makeup to create the costume for you. A mask can be a very awesome way to show your Halloween spirit and you can choose any type of costume with your mask. If you are going to attend a party on this Halloween, then you must be thinking about to have a kind of look which can grab the attention of the peoples in the Party. This DIY Halloween Mask can be done very easily and will not take much time. To learn a complete direction and required material for this DIY makeup. Follow the www.mineralogiemakeup.com for a complete tutorial. Everyone does lot’s of preparation for the Halloween and without doing makeup Halloween can be completed. This awesome Harley Quinn Halloween Makeup can give a chance to rock the party on Halloween day. Costumes always plays very important role in the makeup. So you must need to choose kind of costume which can look perfect with your makeup. Katya has done awesome work to make this makeup and costume for the Halloween. If you like this makeup idea and wanted to have it on this Halloween. Then follow the stylesprinter.com for step by step direction and required material for this DIY project. So get your stuff ready and rock the Halloween party with this stunning look. As we know that Halloween is a big festival celebrated by the peoples around the world. Every country has their own culture and we can see the culture touch in all the festival. When we talk about the Indian culture there are lot’s of thing come in our mind. We are not going to discuss about the Indian culture here. We here to show how you can do the Indian Halloween Makeup. Well, so if you are Indian and love to celebrate the Halloween then you must love to give to try this Awesome Indian Halloween Makeup. Any makeup cannot be look perfect without having an awesome costume according to your makeup. You can choose some color for your eye shadow and keep your makeup simple. This makeup can be done very easily and will not take much time. If you want to learn a complete direction and required material for this DIY makeup tutorial. Then you must love to follow the YouTube below the image. MakeupByLeslieX3 explain step by step direction to make this makeup in the YouTube Video. Joker Halloween Makeup was not much popular until it’s arrived in movie with batman. After that movie character of Joker increasing the popularity among the peoples’ year by year. Now joker is a most popular for the Halloween makeup. So if you are a person who want to have a freaky joker look on this Halloween then you are at right place. This makes required the material like Paintbrush, Eyeshadow brush, Cotton balls, Makeup sponge, Matte black eyeshadow, Black, white and red face paint, Liquid latex. So before you start your makeup for this Halloween, grab the required material mentioned above. Now you must we think about where to start the makeup. No need to worry. Just follow the www.sheknows.com and you will get the step by step direction for this makeup. The best thing about in choosing Joker Halloween makeup that it’s very easy to make and can be done in very quick time. When all are busy in the preparation of the festival. We always not get enough time for our self. As Halloween is a big festival and we have to lot’s thing for this festival. Makeup is a most important thing for the Halloween and without make make up this festival cannot be look perfect. So if you are a person who is taking care all the decoration thing in this festival. Then must be you are not going to get time for your Makeup. But is not means you are going to celebrate Halloween without having an awesome makeup. There are some makeup which can be done in Last Minute. This Half Skull Half Glamour Halloween Makeup can be a perfect choice for the last minute makeup. This makeup is very easy and can be done in very quick time. So if you like this makeup and wanted to learn how you can make it by yourself. Follow the en.paperblog.com for a step by step direction and required material for this DIY Makeup. We all are looking for a kind of makeup for the Halloween witch gives an awesome look and can be done very easily. This amazing Leopard Halloween Makeup can be a perfect choice for this Halloween. Choose costume which can match with your makeup and you will be rocking the party. If you like this makeup and wanted to learn how you can make it. First collection the required material for the makeup. When you choose your makeup design you must have chosen your costume and hairstyle for an amazing look. Follow the YouTube video below the image for a step by step direction of this DIY Halloween makeup. Heather did an awesome work to make this makeup look very easy. You can follow the thedomesticdiva.org for more Beauty & Lifestyle tutorials. If you are thinking to have a long look for this Halloween. Then you are at right place. The above Lion Halloween Makeup look awesome and can be a perfect choice to rock the party. As we know that all makeup starts with the basic foundation. Once you finish with putting the foundation on your face. Use the pink color shade to set your eye base. As eyes and your nose is most important part of this Makeup and your whole makeup will around these two parts of your face. If you want a kind of tutorial which can guide you to make your own DIY Lion Halloween Makeup. Then you must love to follow the following YouTube video under the Image. Sammy Robinson did a stunning work and make something very awesome which can help you to make your own DIY Halloween Makeup. There are different types of makeup, which you choose as your Halloween Makeup. But if you are looking for a Stretched Lips makeup for this Halloween then you are at right place. To the beginning of this makeup you need to clean your face, so if there is any dirt or oil can clean. Next, step to sketch out the design of your face. You can use any color eyeliner to make a rectangular design, shape around your mouth. Use the same eyeliner to sketch a shape where you want your teeth. Now design the teeth accordingly, make sure that you have left enough space for the teeth, it will help to color them easily. To see the complete tutorial and required material for DIY makeup. Follow the YouTube Video below the image for a full tutorial. This awesome Lips Halloween Makeup can grab the attention of the peoples in the party. This makeup is very easy and will not take your much time. Angelina Jolie look in the movie Maleficent was very popular and people love that look from all over the world. Not this look is also very popular for Halloween makeup and costume. So if you are a person who loves that Angelina Jolie looks and wanted to have the same look on this Halloween then you must love to give a try to this Awesome Maleficent Halloween Makeup. To get this look you first need to collect the required material for this Makeup. You can all the required stuff from the local store. Once you have all the things which required for this make then you just need to follow the YouTube video below the image to know how you have to place them perfectly. This video tutorial will guide you step by step to make this makeup. It will also help you if you have missed any material which required for this Makeup. The mast is a most important thing for this makeup because the rest of the things going to be connected to the mask. Follow the video and get the look which you want. A mermaid is a legendary aquatic creature with the head and upper body of a female human and the tail of a fish. This creature look is very popular among the women and they love to get this Look for the Halloween. In this makeup, costume play very important role. So before you start you Mermaid Halloween Makeup get ready with your costume. You can get the costume from the local store and yes, you must need to collect the required thing for the makeup before the start. If you like this awesome Mermaid makeup and wanted have this look on this Halloween. Then you must need to learn how you can get this look by yourself. This makeup will definitely grab the attention of the peoples in the party and you will definitely rock the party with this look. To learn a complete direction and required material for this DIY makeup follow the YouTube video below the image for a complete tutorial. Carli Bybel has done awesome work and you will definitely love this Tutorial. If you want to celebrate the Halloween in the real way, then you must have to choose a kind of Makeup and costume which can look very creepy and scary. As we know that you can do any type of mouth makeup. But this Mouth Halloween Makeup will definitely scare the peoples in the party and your guest. No other makeup can look more creepy and scary compare to this stunning Exploded face makeup. The best thing about this makeup that it can be in very quick time. So you can make in your last minute as well. This Exploded face makeup did by the ellimacs sfx makeup. If you like this makeup and wanted to learn how you can make do it yourself. Then Follow the video below the image for a step by step direction and required material for this DIY makeup tutorial. Peacock is a most beautiful bird in this world. If you are a person who loves birds, then you definitely love the Peacock. Peoples love to get a different look for the Halloween, but Most women don’t know how to face paint. So they always look for a kind of tutorial which can help them to get a look which they want. This awesome Peacock Halloween Makeup can give a very charming and stunning look to rock the party. Before you start your Peacock Makeup, you must need to collect the required thing for this makeup. If you don’t know want material required for this makeup. Then you can follow the YouTube video below the image. In this video, you will get step by step direction and required material for this DIY Makeup. You can also follow the www.twistmepretty.com to read the direction. Pirates of the Caribbean is a very famous movie series and the most popular character of this movie is Jack Sparrow. The getup of Jack Sparrow is very popular and most of the people love this movie because of this awesome character. Pirates are also very popular for the Halloween makeup. Please love to have an awesome Pirate Halloween Makeup. So if you are a person who wants to get the Pirate look for this Halloween then you must love to have a kind of Tutorial which can help you to get the perfect Pirate look. This makeup can wear by women and men. There is nothing more stunning than a swashbuckling pirate and this stunning look is no exception. So if you want to learn how you can get this look. You must love to follow the www.makeupgeek.com for a step by step direction and required material for this Awesome DIY Makeup Tutorial. The Pop art is an art movement that emerged in the mid-1950s in Britain and the late 1950s in the United States. This Pop art employs aspects of mass culture, such as advertising, comic books, and mundane cultural objects. This art is very popular and people love to use this art in the Halloween Makeup. So if you don’t have enough money to hire a makeup artist or purchase a costly costume for this Halloween. Then Pop Art Halloween Makeup can a perfect choice for you. This Pop Art Makeup is very easy and can be done in very quick time. To learn how you can do it yourself this makeup. You have two choices. If you love to read, then you can follow the belltimemagazine.ie for a step by step direction and required material for this DIY makeup tutorial. Some peoples don’t love to read and if you are those types of peoples, then you must love to follow the YouTube video below the image for a complete direction. We all imagine about the princess and as we know that princess always looks very pretty and beautiful. But when we talked about the Halloween, we always want a kind of look which can look creepy and scary. There are many makeup ideas which can be done for the Halloween. But if you really want something which can look very scary and unique. Cartoon Zombie Princess Halloween Makeup can be a perfect choice for you. You can do it yourself this makeup and it can be done in very quick time. If you are a person who doesn’t want to spend money on the makeup and costume. Then you can give a try to make your own DIY Halloween makeup this year. To learn a complete direction and required material for this DIY Makeup. Follow the www.cutoutandkeep.net for a step by step direction. If you are a person who loves to get ready for the festival. The Halloween is a perfect time to show your creativity in the Makeup. There are many types of makeup, which you can adopt for the Halloween. As we know that most popular makeup for the Halloween is scary and creepy. But that does not mean you can’t do other makeup. Scarecrow Halloween Makeup is also a very popular makeup idea for the Halloween. Choose your Halloween costume according to your make and you will be ready to grab the attention of the peoples in the party. If you like this awesome Makeup and wanted to learn how you can do it yourself. Then you must love to follow the thedomesticdiva.org to learn a complete direction and required material for this awesome DIY makeup for Halloween. Scary is a most popular makeup theme for the Halloween and everyone want to look scary on Halloween. So if you are a person who wants to have a scary look for this Halloween then this very Creepy Girl With Ripped Mouth can be a perfect choice for you. If you like this makeup and wanted to learn how you can make it by yourself. Then Follow the YouTube below the image for a step by step direction and required material for this DIY Makeup Tutorial. No one wants a Halloween to pass without doing a spooky makeup look. But when you start thinking about the Halloween makeup there are lot’s of thing come in our mind. That what type of makeup we can choose and what themes will look perfect according to your Halloween costume. So before you choose any makeup, make sure that you will be able to make that makeup by yourself. Always choose a kind of Makeup which is simple and can be done in quick time. The meaning of Simple Halloween Makeup, It must be a kind of makeup, which can give you very awesome look and can be done very easily. If you like this Skeleton Skull Makeup and wanted to learn how you can do it yourself. Then you must love to follow the www.thewonderforest.com or a YouTube video below the image for a step by step direction and required material for this DIY Makeup. If you have kept the Halloween Makeup and costume at the bottom of your Halloween to-do list. Then you must need to a kind of costume and makeup idea which can be done very easily and quickly. So if you are looking for that kind of makeup and costume which can be done less than an hour then you are at right place. This awesome Glam Skeleton Makeup can be a perfect choice for you on this Halloween. The material you required for this Makeup is Light foundation, Black liquid eyeliner, Black eyeshadow, Eyeshadow brush, White eyeliner and Angled eyeliner brush. If you like this makeup and wanted to learn step by step direction to make this Makeup. You must love to follow the stylecaster.com for a complete tutorial. This tutorial also guides you to make your own costume for this Makeup. The combination of makeup and costume will give you an awesome look for this Halloween. Choosing makeup and costume theme for the Halloween is always a tough task. As Halloween is a festival where people love to have the creepy and scary look. Makeup plays an important role to get a kind of look which really looks creepy and scary. Only makeup can’t do the thing for you. So you need to choose a kind of costume which can match with your makeup. This awesome Spider Halloween Makeup can be a perfect choice for yourself on this Halloween. The Material required for this Makeup are Theater white, black liquid eyeliner, black & pink eyeshadow, brown eyebrow pencil or eye pencil, gray / Silver and white eye Pencil. To learn how you can do this makeup by yourself in very easy and quick way. Follow the YouTube video below the image for a step by step direction for this Awesome DIY Halloween Makeup. As per my opinion, the makeup, which I like most is Sugar Skull Makeup. No other makeup can look more awesome and beautiful compared to Sugar Skull Makeup. If you really want to make your Halloween special this year. Then you must need to give a try this stunning Sugar Skull Halloween Makeup. You can use as many as color in this makeup according to your choice. When you decide to, you make the Sugar Skull Makeup, you also need to take care some other stuff as well. Like your hairstyle, costume. Doing Sugar Skull Makeup is a little bit tough task. But if you do the perfect planning and have enough time for this makeup, then you can do it yourself as well. A DIY Sugar Skull Makeup can make your task easy. So if you like this makeup and wanted to have it on this coming Halloween. You must love to learn a complete direction and required material for this makeup. Follow the www.shelookbook.com to learn a step by step direction for this stunning DIY makeup. A tiger is the most dangerous animal and every human scare from Tiger. As Halloween is a festival of scary and creepy thing. So if you want to have a kind of look which can give that look. Then Tiger Halloween Makeup can be a perfect choice for those peoples who want to look scary. When you decide to choose to Tiger Makeup for Halloween. You must have to keep in mind some other things as well. Like your hairstyle and hair color and a perfect costume which can match with your Tiger Makeup. The basis of any makeup that clean your face, so if there are any dirt or oil can be removed. Once your face is dry, the first thing you need to do is the basic foundation on your face. You can choose any type of foundation according to your choice. If you are a person who don’t love to read much then the YouTube below the image will guide you step by step. We all have seen the vampire in the movies and we never wish to meet them in real life. As Halloween is a festival for creepy and scary thing. People love to different types of makeup for this festival. But if you are a person who really want to have a very creepy look then no other makeup can be better than Vampire Halloween Makeup. This makeup will definitely help you to rock the Halloween Party. Any makeup cannot be look perfect without having a kind of costume which can match with your makeup. If you like this makeup and wanted to learn a complete direction that how you can do it yourself. You have two ways to learn about this makeup. If you are the kind of person who love to read, then you can follow the www.thediydiary.com. But if you don’t like to read, then follow the YouTube video below the image for a step by step direction and required material for this awesome DIY Halloween Makeup idea. Witch Halloween Makeup can be perfect options for Halloween this year. As there are so many choices in the makeup, but if you don’t want to spend much time on your makeup, then Witch Makeup can be a best option for you. The thing you need to purchase from the dollar store or from the Halloween store are spider web which you will use around your eyes. The second thing is the eyelashes, you need them, use on your eyes. The third thing is nice. These nails will give your very scary Witch look. To learn a complete direction of this makeup and how you need to use these makeup materials. Follow the YouTube video below the image for a step by step direction and required material if we miss to mention above. The fear of the Wolf is pervasive in many human societies, the majority of recorded attacks on people has been attributed to animals suffering from rabies. Non-rabid Wolf has attacked and killed people, mainly children. The wolf is the most dangerous animal and it’s a symbol of fear. As we know that Halloween is a festival of fear and people do different type of makeup which can look creepy and scary. If you really want a kind of makeup, which can help you to scare your guest and peoples in the party. The Wolf Halloween Makeup can be a perfect choice for you. Getting the look of Wolf is very easy and can be achieved in very quick time. If you like this makeup idea and wanted to learn how you can get this look by yourself. The YouTube below the image will guide you step by step to get this look and you will also get information about the required material for this Awesome DIY Halloween Makeup. Are you a fan of Zipper Halloween Makeup? Then you must love this awesome makeup idea for the Halloween. Follow the below steps to learn a complete direction of this makeup. Cut of your zipper an unnecessary part with scissors. With a linear mark an area where you want to put the zipper. Now cut the zipper which can match the length of your mark area. Next step tear a cotton puff into a small piece. For more steps follow the YouTube video below the image. You will get complete direction and step to use the material in this makeup. Get the Zombie look for this Halloween. You can achieve this awesome makeup shown in the above picture very easily. As we know the Zombie is a very popular theme for the Halloween makeup and people love to have it. Because Halloween is a festival of creepy and scary thing and no other makeup can look more creepy and scary compare to Zombie makeup. You can get this look very easily. If you like this makeup idea and wanted to learn how you can do it yourself. Follow the YouTube video below the image for a complete direction and required material for this awesome DIY Halloween Makeup.